For the updated tutorial go here. Here is the 2 little hooligans play tent tutorial. Hope you are able to find a little time to sew one up for the kids. This is where ours will be hanging, out by the garden. Use a stitch length of 1, and make sure you zig-zag stitch or serge over all raw edges. Start off by either cutting your ribbon to the following sizes or making your own ties. I made my ties by using my bias tape maker. Cut out 6 triangles, each measuring about 24" long on the sides and 22" wide at the base. Make the curve in the triangle by placing the hula hoop on base of triangle. Trace and cut. Triangles should now be about 21 1/2" from tip of triangle to the middle of curve. With right sides facing, sew two triangles together on one side. Sew one more triangle to the other two. Should have three triangles sewn together like here. Repeat with the other three triangles. Take the 30" by 1" wide tie and sew a loop on one end. This will be used inside of tent to hang things on. Take one of the triangle sets and pin the looped tie to right side of fabric. Let it overhang a few inches like above. With right sides facing, pin other triangle set on top of the first one. Pin in place on the straight edge only and sew. Make sure you back stitch a few times over the tie. This needs to be very sturdy. This is what the tent will be hanging by. Should look like this so far. If you want to, at this point add some Velcro to the tie. Should look like this on bottom side. Gather the four 1/2" ties. Evenly space them out around the top (circle.) Pin the ties in place. I left about 8" hanging off the top, which will be used to tie the hula hoop on. The longest part of the ties are going to end up being on the outside of tent and will be tied into a bow. Sew in place, remember to back stitch a few times! Now get out the two sheets that will be used for the sides of tent. Since the sheets only measure 96" long, you are going to have to cut about 35" from the second sheet and attach it to the first sheet. Pin right sides of sheets together. Before you sew the sheets together, measure down about 25" from the top of where the two sheets will be sewn together. Place the middle of the 80" by 2" wide tie half way in. You will end up with half of the tie on the right sides of fabric and the other half will be hanging out. Sew sheets together. Now it is time to sew the sheets and top (circle.) together. Start by pinning right sides of top (circle) and sheets together. Make sure that the long ties are tucked in and short ties are hanging on the outside. The sheets will overlap one another about 3" or so at the end. That is what you want. It will make the opening of the tent a little sturdier. Here is the overlap and the opening that will be your door. You can see the extra sheet that was sewn together and the overlapped part. Finish off raw edges of sheet. My sheets came in these cute little bags, so I just had to use them. I sewed two of them on the inside of tent about 20" from bottom. And these on the outside of tent. I placed mine about 12" from the door at staggered heights. You are now finished sewing! Time to attach the hoop. Turn tent inside out and tie hoop on with the little ties. Should have this now, turn right side out and you are finished! Find a great spot to tie or anchor the tent to. **Please feel free to use this tutorial for your personal sewing projects. You may link this to your blog and use any photo's, just be kind and give credit where credit is due. I spent many late nights working on this. Happy sewing! Any questions or comments please contact me. Cool play tent. Following from Friend Fridays. Hope you come follow me! I found your blog on Follow Me Friday. I'm now your newest follower! Stop by if you get a chance! How much fun is that?! Thanks for such a great tutorial! This is so cool! I'm visiting from New Friend Friday. I signed up to be a new follower. Thanks for the tutorial! I have 6 girls who will love this, though I'll probably have to make more than one! awesome job, I love it. Oh my goodness, I love love love this!!! Thanks so much for the tutorial, I saw something like this in a magazine and totally wanted to make one but I never would have thought of using a hula hoop! You've made my crafty week! LOVE! LOVE! LOVE It! I have been searching for a tent I could actually afford to make my Niece! So Glad I found You! !Thank You!! This looks awesome!!!! I wish we had a place to hang one of these!!! Brilliantly simple but very effective. The same pattern could be used for a castle (greyish material for the walls of a stone tower),a space rocket (white with appliqued vents, flags etc). These would be great in my school as they would take up very little space when stored and have endless possibilities for role-play. You should manufacture them - $50 a time would undercut the opposition and sell like hotcakes. I am going to make several of these post haste. I want to use it as a changing tent. We often come home from the beach or camping and I hate for the kids to track their dirt into the house only to dump it all on the bathroom floor. Now they will be able to take it all off outside, brush off, and wear a towel into the house to take a bath. I love it! SO great! Now I just need a tree!! This is WONDERFUL. Thank you so much for sharing the directions. Wow, this is amazing!!! I was blog-hopping and found you. Wish I had time to make one of these. So fun. this turned out so adorable, I bet the kids love it! This is so cute.. A great summer craft for me and funhouse for the kids. Thanks! How fun. Now I just need a tree big enough to hang one in. :) Great job and nice tutorial. I'm bookmarking this! I need one for my classroom and one for my own kids. I'm visiting from Somewhat Simple. I'd love it if you'd stop by and link up to my Home and Family Friday Linky Party. I host each Friday. Hope you'll come join us! I adore this! Thank you so much for the great tutorial. Every morning I get a cup of coffee and "sift" through my blogger reading list. Coincidentally, I was thinking that I either need to make or buy a tent for my daughter. Saw the link on Kojodesigns and I love this! Thank you! Thank you! Cool tent! I'd love to adapt the idea into a "grown up" version and put it above my deck somehow... I'll send you a link if I do! This looks so fun! Awesome tuturial...just wish I could sew! This is brilliant! You could also use shower curtain liners and use it as a privacy tent for showering while camping. Such a fantastic idea... thanks for sharing! I think my favorite part is how you incorporated the pouches that the sheets came in! :>) I linked to this on my weekly roundup - thanks so much for sharing! SOOO cool. i wish i could sew!!! Super cute! I am bookmarking this for my to-do list and adding your blog to my google reader. P.S. I love your blog design. Did you do it yourself? What a great project. My mom never made me a cool tent like that. I have been wanting to make one of these since I saw it in Family Fun Magazine a couple of years ago! Very cool! When I saw this, I thought this would be super neat to have when you are swimming somewhere without any changing facilities. I also like Liz's idea to have her kids change outside when they are all sandy and wet. Wish I had one of these years ago! I love this tent idea. It looks so simple, and definitely pretty! I want to make one now... but if only I had a tree to hang it. Easy Peasy! And so much fun! This is such an awesome idea! Thanks for posting a tutorial! Great job! My boys are going to love this one ... maybe for next summer (at the rate I'm going) hehe! WOW! I love this . Great idea! You can find sheets on clearance for pretty cheap. Whata fun project. I love the idea. It crossed my mind to use clearance priced colorful shower curtains to make it water repellent for outdoor use, especially for the top. The frabic ones that are also water repellent could be used for the sides. If you replaced the hula hoop with PVC pipe (it's cheap), you could adjust the size of the circle. Just came over from Sew Mama Sew. I love this idea and after some rearranging in my daughter's bedroom, I think this might be just the thing to make a reading corner... Now I've gotta choose just the right sheets! This would be great to have set up in the summertime for a changing room for our pool! Totally fantastic Christina! Beautiful job. Glad you used the little bags for the sheets; they work perfectly. just finish one for my son, thanks for the tutorial! Love this, and I am gong to attempt to make it for my niece. But I have a question-how can I make this using fabric by the yard? Is that feasible? I want to make one using sari fabric. I guess my question is...how many yards make up a twin sized sheet? I found your blog thanks to Jill ( home made by Jill ). It's absolutely fantastic ! 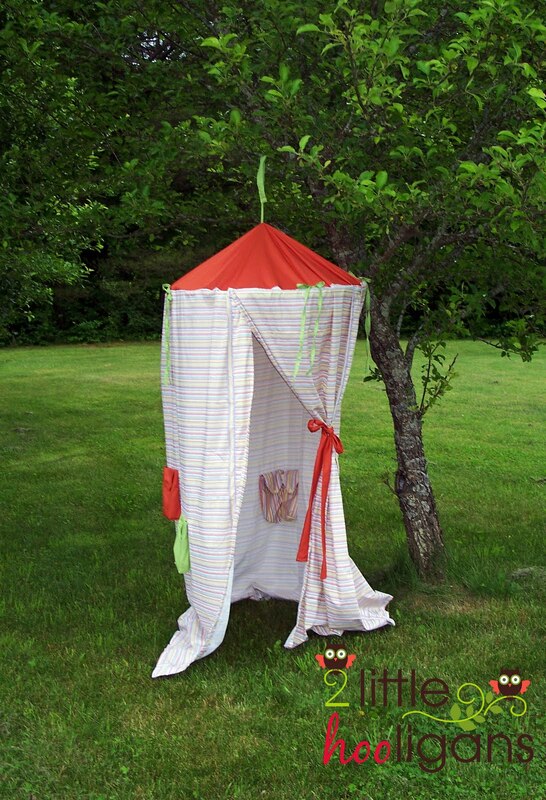 Very cool - now maybe I can ditch the ugly Dora tent that the kids played in last summer! This rocks. I am so inspired to make this today, and I am going to! YAY!!! I saw this on pinterest. What a fantastic idea... Must make one for my granddaughter... Thank you so much. What a great Christmas idea! I love this and am in the process of getting materials together. Do you know roughly what size hoop your plan works for? I loved the flowers on your other post too. I am going to attempt a small window hole and "flower box" pocket. Thanks for sharing! I decided that I had to get into sewing, so after a new sewing machine, and having my mom come over to help we started on this project for my kids tonight. My twin sheet is 91". Is this typical? Also, as a new sewer here which way do I sew both sheets together. I hope that you don't mind the questions..
some sheets do come in different sizes. instead of cutting 35" from the second sheet, cut 40" instead. you are going to sew the bottom of the whole sheet with the cut 40" piece from the second sheet, right sides facing when you sew together. does that help? just let me know, im here to help you out.